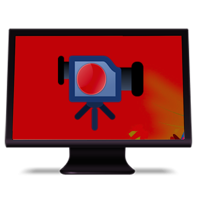 Record your videos at full screen or any size (What you see what you get). Record the audio with computer audio ,online audio ,system build-in microphone or audio input device. Add webcam video on screen. Add the mouse click animation. Record online video, choose record computer audio. Add your own logo or signature to any area of the captured screen. Record video format mov or mp4 .